Munich is the third largest city in Germany, after Berlin and Hamburg, with a population of around 1.49 million. The Munich Metropolitan Region is home to 5.6 million people. The name of the city is derived from the Old High German term Munichen, meaning "by the monks". It derives from the monks of the Benedictine order who ran a monastery at the place that was later to become the Old Town of Munich; hence the monk depicted on the city's coat of arms. Munich is home to many national and international authorities, major universities, major museums and theaters. Its numerous architectural attractions, international sports events, exhibitions, conferences and Oktoberfest attract considerable tourism. Since 2006, the city's motto has been "München mag dich" ("Munich loves you"). At the centre of the city is the Marienplatz—a large open square named after the Mariensäule, a Marian column in its centre—with the Old and the New Town Hall. Its tower contains the Rathaus-Glockenspiel. Three gates of the demolished medieval fortification have survived to this day—the Isartor in the east, the Sendlinger Tor in the south and the Karlstor in the west of the inner city. The Karlstor leads up to the Stachus, a grand square dominated by the Justizpalast (Palace of Justice) and a fountain. The Peterskirche close to Marienplatz is the oldest church of the inner city. It was first built during the Romanesque period, and was the focus of the early monastic settlement in Munich before the city's official foundation in 1158. Nearby St. Peter the Gothic hall-church Heiliggeistkirche (The Church of the Holy Spirit) was converted to baroque style from 1724 onwards and looks down upon the Viktualienmarkt, the most popular market of Munich. Munich is a green city with numerous parks. The Englischer Garten, close to the city centre and covering an area of 3.7 km2 (1.4 sq mi) (larger than Central Park in New York), is one of the world's largest urban public parks, and contains a nudist area, jogging tracks and bridle-paths. It was designed and laid out by Benjamin Thompson, Count of Rumford, for both pleasure and as a work area for the city's vagrants and homeless. Nowadays it is entirely a park with multiple Biergartens, the most well known at the Chinese Pagoda. Other large green spaces are the modern Olympiapark, Westpark, and the parks of Nymphenburg Palace (with the Botanischer Garten München-Nymphenburg to the north), and Schleissheim Palace. 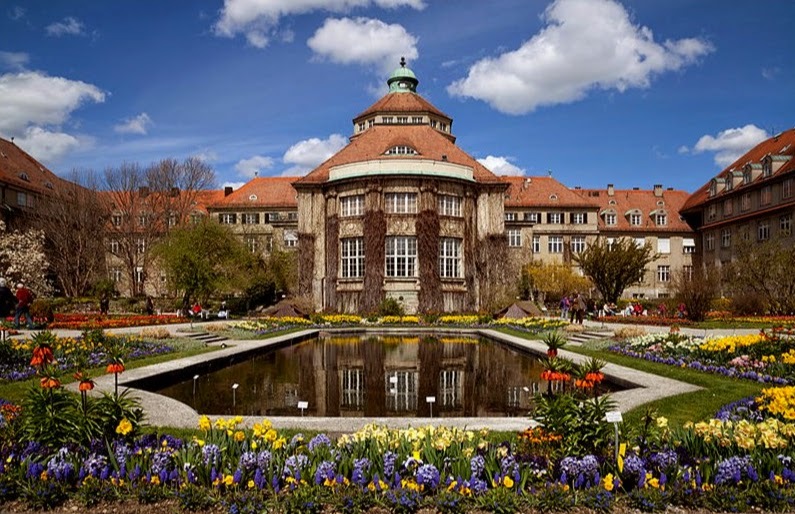 The city's oldest park is the Hofgarten, near the Residenz, and dating back to the 16th century. Best known for the largest beergarden in the town is the former royal Hirschgarten, founded in 1780 for deer which still live there. The city's zoo is the Tierpark Hellabrunn near the Flaucher Island in the Isar in the south of the city. Another notable park is Ostpark, located in Perlach-Ramersdorf area which houses the swimming area, Michaelibad, one of the largest in Munich. 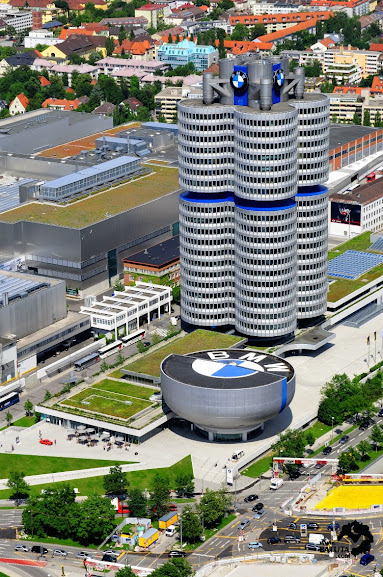 Munich is a Financial centre and a Global city and holds the headquarters of Siemens AG (electronics), BMW (car), MAN AG (truck manufacturer, engineering), Linde (gases), Allianz (insurance), Munich Re (re-insurance), and Rohde & Schwarz (electronics). Among German cities with more than 500,000 inhabitants purchasing power is highest in Munich (26,648 euro per inhabitant) as of 2007. In 2006, Munich blue-collar workers enjoyed an average hourly wage of 18.62 euro (ca. $23). The oldest church within the city borders is Heilig Kreuz in Fröttmaning next to the Allianz-Arena, known for its Romanesque fresco. Most high-rise buildings are clustered at the northern edge of Munich in the skyline, like the Hypo-Haus, the Arabella High-Rise Building, the Highlight Towers, Uptown Munich, Münchner Tor and the BMW Headquarters next to the Olympic Park. Munich bid to host the 2018 Winter Olympic Games but lost to Pyeongchang. In September 2011 the DOSB President Thomas Bach confirmed that Munich would bid again for the Winter Olympics in the future. Munich is home to several professional football teams including Bayern Munich, Germany's most successful club and a multiple UEFA Champions League winner. The Munich area currently has three clubs: Bayern Munich, 1860 Munich and SpVgg Unterhaching in the Bundesliga, 2. Bundesliga, and 3. Liga respectively, which are the top three leagues in the German football league system.